Greetings all friends of Truth! Great News! 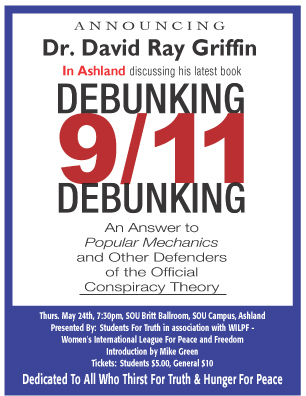 On Thursday, May 24, 2007, Dr. David Ray Griffin will discuss his latest book entitled "Debunking 9/11 Debunking: An Answer to Popular Mechanics and Other Defenders of the Official Conspiracy Theory" at SOU Britt Ballroom on the SOU Campus, Ashland, Oregon. Doors open at 7:00pm, the event begins at 7:30pm and will runfor approx. 1-1/2 hours, including a 30 minute post-discussion Q & A session. Mike Green, author of “The Whole Truth About The U.S. War On Terror” with introduce Dr. Griffin. David Ray Griffin is professor of philosophy of religion and theology, emeritus, at Claremont School of Theology and Claremont Graduate University in Claremont, California, where he remains a co-director of the Center for Process Studies. His 30 books include The New Pearl Harbor: Disturbing Questions about the Bush Administration and 9/11 (2004), The 9/11 Commission Report: Omissions and Distortions (2005), 9/11 and American Empire (2006, ed. with Peter Dale Scott), and Christian Faith and the Truth behind 9/11 (2006).